Your blouse waited enough to be finished. The bust, sleeves and cuffs should not present any more secrets for you. It is the time to deal with the masterpiece: the collar. As this is a fairly complicated part to draw, I have chosen to present a simplified version: the self collar stand. The collar band is less high and less close to the neck than for the classic shirt collar (with separate collar stand). 1. 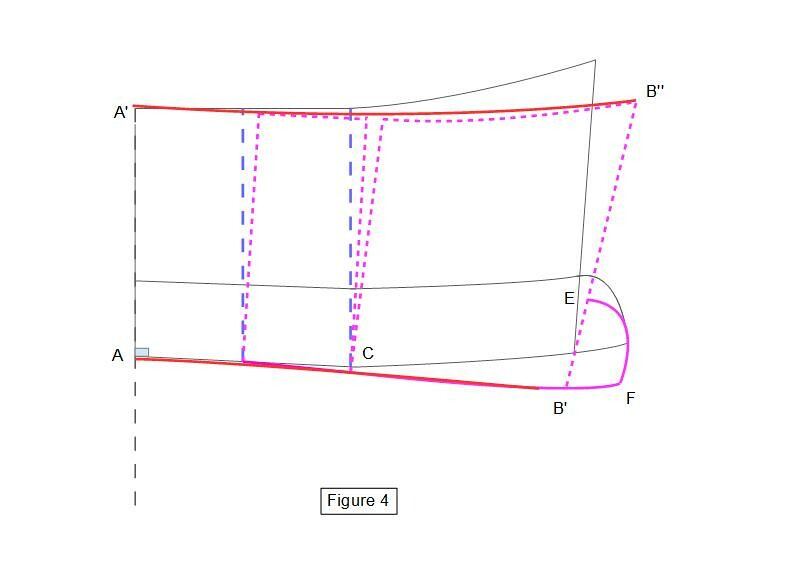 Perpendicular to this line, draw AB = 1/2 neckline measurement. 2. Parallel to center back, trace BB ‘= 1/20 AB. 3. AC = ½ AB. Join CB ‘ by a slight curve. 4. 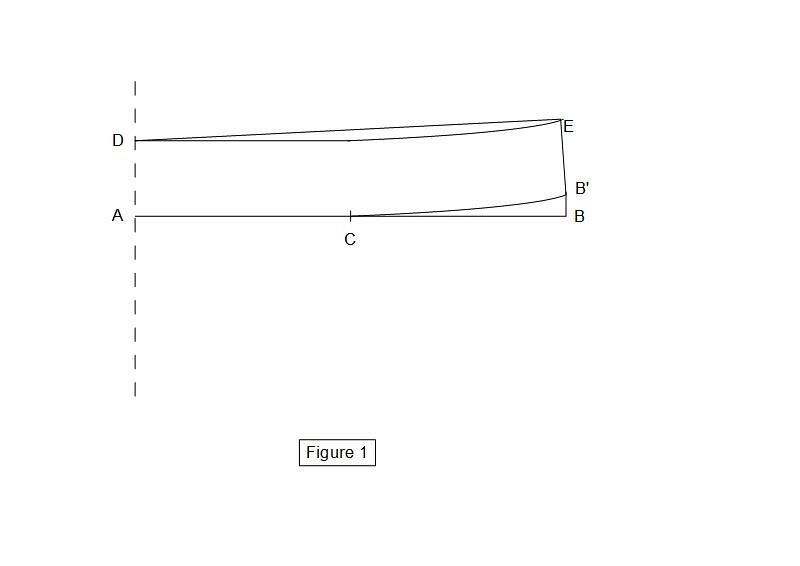 B’E = AD = 2 cm (collar band width), B’E being perpendicular to B’C. 5. Draw a straight line DE and outline crease line parallel to neckline ACB ‘. 6. Drop A to A ‘and C to C’ = 2 cm. DA = collar fall width = 4 cm. 7. Extend EB ‘ to EB’ ‘= 6.5 to 8 cm. 8. 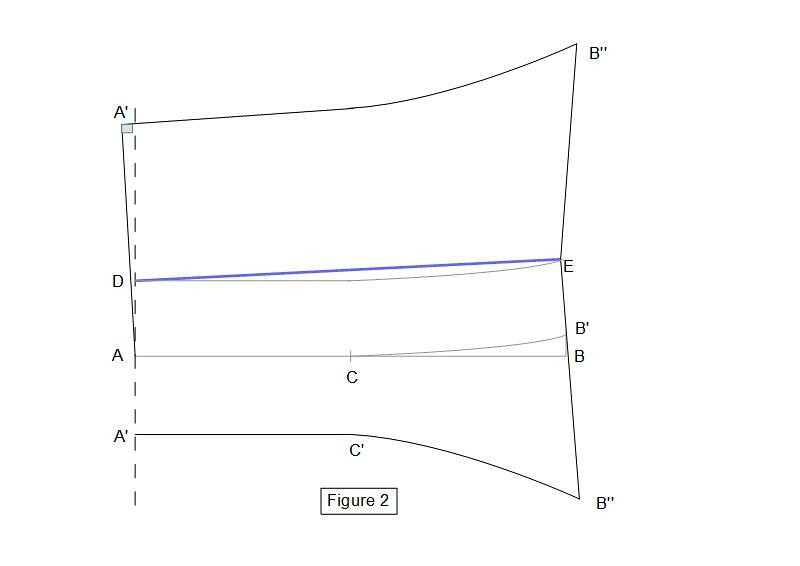 Draw A’C’ with a straight line and join C’B” by a curve. 9. Fold crease line DE and outline collar fall DA’C’B”E. 10. Re-draw new center back line AA ‘ with a straight line. Keep a right angle at A ‘. 11. You can extend the center front to accomodate a button. For this, extend CB’ with the amount of overlap = B’F. 12. 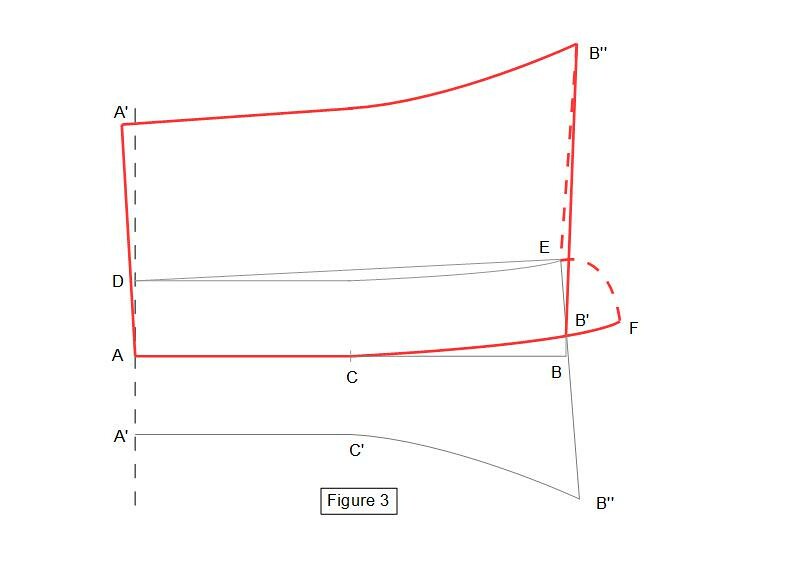 Your new collar edge is: ACFEB”A ‘(in red on Figure 3). 13. Draw two gap lines perpendicular to AC, one from C and one from the middle of AC. 14. Cut along these lines and open 0.5 cm along collar edge. 15. Re-draw ACB’F and A’B” maintaining a right angle at center back. 16. Verify that collar neckline measurement and garment neckline measurement are identical. I hope these tutorials have not given you headaches and come back soon for lighter posts. I like your sewing blog, because you have great tutorials. Thank you.